and receive a thank you discount for your friend ... and you too! As we have such a high amount of referrals, we thought it was about time we rewarded people for spreading the Jimmy Chop Chop love. It’s simple really … ask at the front of house, requesting your ‘Recommend a Friend’ card. (Just remember… your friend HAS to be a Chop Chop virgin for this to work). Follow the instructions on the card and we’ll do the rest. So what are you waiting for? Go forth and spread some Jimmy Chop Chop lovin’! Voucher comes in 2 parts – ‘Friend’ part MUST be redeemed first for ‘Client’ part to be valid. ‘Client’ can only redeem their discount on their first visit after the ‘Friend’ has visited (there is no expiry time). 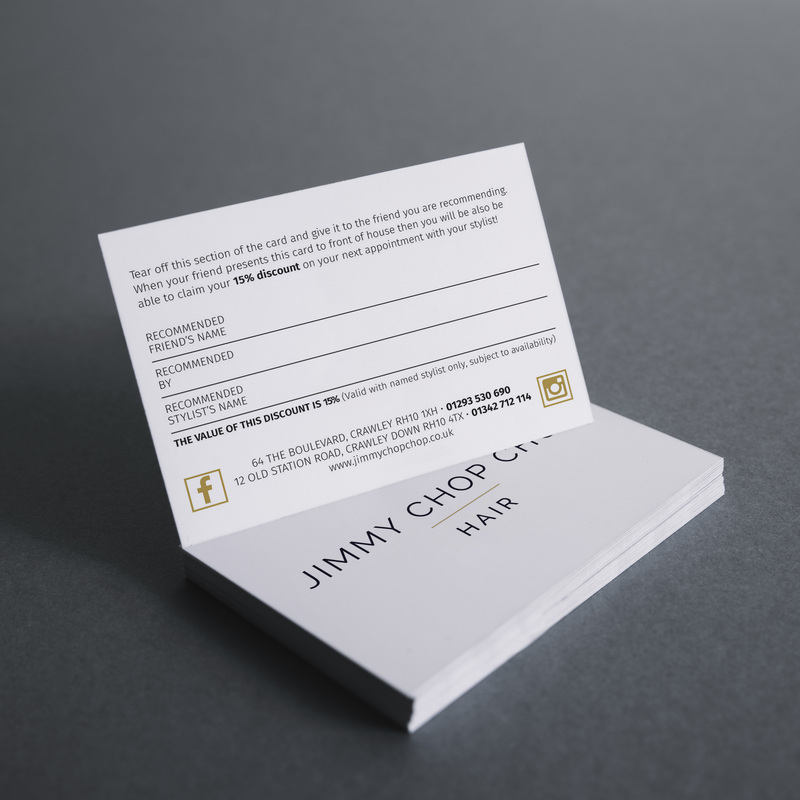 Vouchers are only redeemable against services at Jimmy Chop Chop, vouchers do not apply to retail. Discounts can only be applied for ‘Friends’ FIRST visit to Jimmy Chop Chop. Referring ‘Client’ must have been to Jimmy Chop Chop in the last SIX months prior to voucher request. Vouchers redeemable for selected stylists and subject to availability. “Recommend a Friend Voucher” MUST be quoted at time of booking appointment by phone for voucher to be valid. T&Cs are subject to change at management’s discretion.